Riley Redgate is a graduate of Kenyon College in Gambier, Ohio. Her first two novels, Noteworthy and Seven Ways We Lie, earned critical acclaim. She lives and writes in Chicago. "This is a gorgeous novel with diverse characters of different ethnicities and sexualities that are true to life in their messiness and earnest missteps. Redgate (Noteworthy, 2016, etc.) treats each character with care, gently guiding them through uncomfortable situations and tender, heartfelt moments. 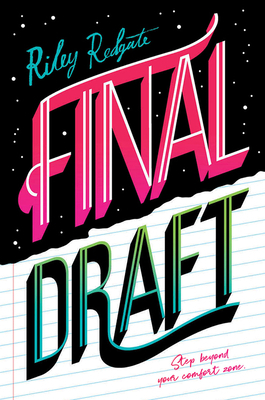 Final Draft hits every mark: A must-read." "Redgate (Noteworthy, 2017) offers up an intensely focused portrait of a girl who, through first love and first loss, begins to find the story she wants to tell. For many cautious teens, watching Laila come into her own will be a triumph." "Redgate’s engaging style draws readers in, and the main character will resonate with young people."